On the west wall of my office is a giant whiteboard. I use it often, but there are times when I want to use my iPad instead. And with the new iPad Pro and its #2 Pencil, I’m finally interested in a good whiteboarding app. Apps that relied on the Apple Pencil never really stuck for me because I rarely had my Apple Pencil nearby, and if it was nearby it was probably out of battery. As you’ve probably heard a thousand times already, that all changed with the new iPad and the new Apple Pencil. Now, I’ve long been a fan of Paper by 53 (though it’s now Paper by WeTransfer) for drawing and sketching. I’ve used it many times to draw visuals to accompany my articles from time to time. But the Paper app hits its limits when you start using it to flesh out bigger ideas and mind maps. I did a bit of my own research, plus asked people on Twitter what they use, and there were a few apps worth mentioning. The two which stood out to me the most were Thoughts and Concepts. What’s great about Thoughts is how simple and straightforward it is. This app is very easy to use. There are only 3 tools: a black pen, a color pen, and an eraser. It also has both a light and dark theme. And there is an iPhone app that it syncs with. Thoughts is just a $2.99 one-time purchase to get the app and you’re set. For me, one big drawback to Thoughts is that you can’t import any types of media onto your canvas. Meaning your whiteboard canvas can’t include images, links, and the like. Another tidbit which took me a while to get used to is that the pen size is relative. When you’re writing and drawing with the pen, it’s always the same visual point size no matter what “zoom” level you are at. At first this bugged me, as I wanted everything to be the exact same, but I then began to acclimate to it and it actually makes sense given the way Thoughts works. Thoughts not only has an infinite canvas, it also has infinite zoom. And, what’s funny but not funny about that is that I actually lost my document. I literally lost some work of mine by zooming out too far. It disappeared in the view and I tried zooming back in but must have been off-center and from there I completely lost my bearings and I literally couldn’t figure out where my drawing went. I lost it to the abyss. So all that to say about Thoughts: it is pretty great because it’s so simple. You just launch the app and get to work. But for me, I found it to be too simple for my ideal workflow. I want to be able to drop in photos, screenshots, text, links, and also have a bit more control over the tools I’m using. The other whiteboarding app I was most drawn to (ha!) was Concepts. John’s and my use-cases and sentiments are nearly identical. I have no need for drawing or sketching or illustrating. But I do love to be able to quickly visualize bigger ideas / projects into something that make sense. And while there are some excellend mind mapping apps for the iPad, I prefer the free-form drawing nature of a whiteboarding app for the brainstorming and ideation process. … I realized that the primary value of an app like Concepts lies in helping users record and refine their ideas. Whether your ideas result in something like [Yarrow] Cheney’s whimsical concept art for The Grinch or my messy soup of notes, screenshots, and highlighting, the core utility of Concepts, which is right there in its name, is the way it facilitates the exploration of ideas. That’s an important distinction that makes Concepts an appropriate choice for iPad users regardless of whether you’re an artist. I haven’t yet spent as much time using Concepts as John has, and so his review taught me a few tips and tricks. And, like John, what I love about the Concepts app is how beautiful and simple it is, and yet how much power lies under the hood. Compared to the Thoughts app, Concepts still gives you an infinite canvas that can go in any direction you like, but you don’t have complete freedom to zoom in / out forever and thus lose your work to the abyss. Additionally, Concepts puts little arrow darts on the edges of the screen, pointing in the direction that you have any drawings or media. Helping you stay oriented. Using a whiteboard app like Concepts is definitely a scenario where the 12.9 iPad Pro would shine and be an excellent tool over the 11. But since I can zoom and scroll the canvas, I don’t feel hindered or cramped using the 11-inch iPad Pro. 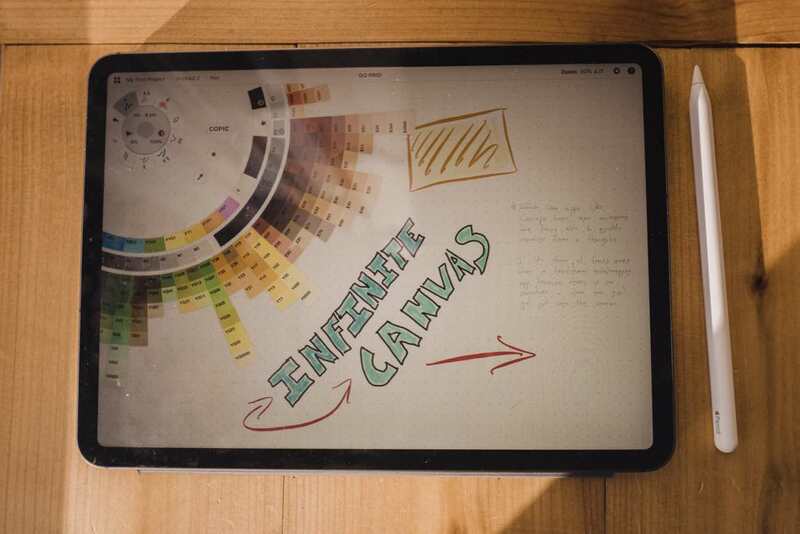 All in all, the power and flexibility of an infinite canvas, whiteboarding app can be liberating to your ideas. Having both Concepts and the new Apple Pencil at my fingertips is a fantastic combination that has become a go-to in my workflow.